In April, 2018, along with scores of volunteer attorneys, migrants and human rights advocates, I responded to an urgent call-to-action requesting assistance on behalf of a large group of migrants expected to arrive soon in Tijuana from Central America. Typically, migrants on the move north do not attract intense media attention. In this instance, when conservative media outlets in the U.S. portrayed the larger-than-normal caravan as a threat to the United States, personal denunciations of the caravan by the President of the Unites States soon followed. Although not covered closely by the media, for approximately the past ten years annual “Stations of the Cross” caravans have crossed the Guatemala border into Mexico around Easter. Organized by the organization Pueblo Sin Fronteras (PSF), (People Without Borders), the annual crossings typically occurred in a low profile manner, adhering to procedures agreed upon by Guatemalan and Mexican immigration authorities. In an article published in the Associated Press April 2, 2018 the initial caravans were described as “…short processions of migrants, some dressed in biblical garb and carrying crosses, an Easter-season protest against the kidnappings, extortion, beatings and killings suffered by many Central Americans as they cross[ed] Mexico.” Organized principally for safety-in-numbers, caravans are comprised of indigent children, women and men who make the journey north travel under very difficult, and often dangerous conditions. Sometimes local communities along the way offer free bus rides, but that mode of transportation is the exception. Caravans trek north by hitching rides in the back of trucks, hike long distances – sometimes at night – sleep both in shelters and sometimes under the stars. One of the most hazardous modes of transit entails climbing aboard the top of “La Bestia” (the Beast), the name given to freight trains that run through the length of Mexico. Given the uncertainties and difficulties of such travel, it is not surprising less than 300 children, women and men ultimately arrived in Tijuana out of an estimated 1,500 who assembled in Tapachula, Mexico for the journey North. According to PSF spokespersons, some migrants dropped off along the way, others decided to seek asylum at different locations throughout Mexico. Once this year’s caravan participants were issued Mexican humanitarian visas or exit visas — a permit that allows foreigners to remain in Mexico for less than two weeks — PAF representatives accompanied the caravan to Tijuana, coordinating stays in shelters, while arranging other supportive services along the way. After a report on the caravan’s progress was posted on the website Buzzfeed, coverage was picked up by Fox News commentators — by all accounts followed closely by president Trump. His first caravan tweet was written Easter morning, criticizing Mexican authorities for allowing the caravan to cross their country. Adding a critique of his own nation’s immigration policies he wrote: “ They laugh at our dumb immigration laws.” As the caravan made its way North, mounting media coverage portrayed its anticipated arrival at the U.S. border as a potential precursor of a Darkness at Noon show down with U. S. Customs staff. Conservative news media described the caravan as a group of “illegal aliens” preparing to descend upon the U.S. border, suggesting some caravan members would likely attempt to cross the border illegally. President Trump’s tweets presaged dramatic changes in U.S. immigration policy. As a follow-up to his assertions regarding the caravan’s “danger” to U.S. sovereignty, Vice President “Mike Pence” tweeted his own denunciation on April 30: “As @POTUS TRUMP said, the 150 person caravan at our Southern border is a direct result of our weak laws and our porous border. This caravan is rightly understood as a deliberate attempt to undermine the laws of this country and the sovereignty of the United States.” Having been put in the bullseye, the caravan became the administration’s immigration bogeyman, albeit a temporary lightning rod in an increasingly heated national debate on immigration enforcement. Although Sessions did not state so specifically, what he outlined had already been implemented operationally. According to a New York Times (NYT) story published April 20, 2018, children had been separated from their parents months before government officials publicly confirmed the practice. The NYT reported: “[According to] data from the Office of Refugee Resettlement, a division of the Department of Health and Human Services, more than 700 children have been taken from adults claiming to be their parents since October , including more than 100 children under the age of 4.” It remains to be seen if the new separation policies will withstand legal challenges. Human rights and migrant rights organizations and Rights First (HRF), a non-profit, nonpartisan, international human rights group, accused the Trump administration of “manufacturing a crisis,” noting: “…conveniently, the president, as well as the secretary of homeland security and attorney general, repeatedly failed to mention the major reasons for the increase in protection requests [at the U.S. borders]: the refugee and displacement crises originating in El Salvador, Guatemala, Honduras and Venezuela. Deadly dangers are forcing people to flee in search of protection.” HRF added that widespread turmoil in the countries cited was well documented and reported on by organizations such as the U.N. Refugee Agency. Displays of welcoming, compassionate and enthusiastic greetings for the migrants were on display across Tijuana when the exhausted caravan members arrived. Historically a hub of refugees, asylum seekers, and deportees, the sprawling and rapidly growing border town readily absorbed the latest arrival of migrants. Being accustomed to a continual influx of foreigners, the city accorded the caravan members a timeworn, but genuine welcome, shrugging off the media commotion that accompanied their arrival. City center streets and arcades teemed with heavy foot traffic, including many cross-border tourists. A curious cacophony of blaring music from restaurants and storefront establishments added to the din, as businesses and street vendors hustled for customers and attention. Wherever I went, I recognized members of the caravan among the throng. Although media attention was given to volunteers and organizations responding to the humanitarian and legal needs of the migrants, coverage barely skimmed the surface of the depth and complexity of the aid. In addition to the collective Pueblo Sin Fronteras, the small bi-national, 501 (c) (3) non-profit, direct legal services organization Al Otro Lado (To the Other Side), helped coordinate the mobilization of volunteers in Tijuana and across the border in the U.S. Shelters included Tijuana’s Casa del Migrante, a long standing migrant shelter run by The Congregation of the Missionaries of St. Charles,-also known as the Scalabrinians. As the caravan’s immediate needs were being addressed in Tijuana, urgent calls-to-action from various U.S. lawyers’ associations and legal services providers went into high gear across southern California, and beyond, urging legal professionals to come to Tijuana. Key players included the Los Angeles County Bar Association, the Southern California Lawyers Association, and the American Immigration Lawyers Association, in addition to U.S.- based refugee and immigration rights groups. On Friday, April 27, an all-day legal prep training covered detention processing procedures, and possible forms of relief available to the migrants, such as asylum and special migrant juvenile status for the unaccompanied immigrant children in the caravan. The key task was to meet with every person to conduct an intake that included: 1. obtaining personal information, i.e., their name, date of birth and birth place, all from documents provided by the migrants; 2. getting names and telephone numbers of family members or sponsors in the United States and Country of Origin; and 3., assessing potential relief based on their stories. Lawyers unable to attend the Friday training were given a crash orientation the next morning. All would soon meet and assess asylum seekers planning to present themselves at San Ysidro customs. This involved intensive one-on- one sessions to determine the strength of their respective cases. My wife, an immigration attorney with a Los Angeles- based legal services not-for-profit, joined the legal support teams; I worked with volunteers scanning and photo copying essential materials, and other tasks as they arose. A spirit of professionalism, coupled with a can-do attitude, enabled volunteer attorneys to transition promptly from training and orientation to meeting with the migrants. Challenges were handled with a combination of humor and resignation. For example, to enable the processing of the approximately 150-200 caravan members, people were divided up into three groups, at three separate locations. The readiness of the sites procured varied significantly. The site I was assigned to was formerly occupied by a veterinary pharmacy. It was completely empty, with no electricity hooked up, with one half of the site’s façade boarded up. With migrants on the way, a deportee who works at Al Otro Lado as a translator quickly borrowed pliers from a neighboring residence and proceeded to restore electricity by reattaching live wires protruding from a wall. He and I then left quickly to find a hardware store — taking a route that took us through the Zona de Tolerancia, Tijuana’s large legal red-light district, — where we purchased extension cords and power strips for powering computers and badly needed fans. On the return walk I made a mental note to investigate the Deported Veterans of America organization we happened across. When we returned, fold-up plastic chairs and tables were in the process of being unloaded and assembled. Interviews had already begun, bright sunlight streaming through the ceiling to floor, unshaded storefront window. Ample time was allotted to ensure thorough intakes would be conducted with all migrants. In addition to checking their identification and other key documentation, the process entailed listening to their claims, i.e., their reasons for fleeing their homeland, to assess the strength of their claims with the credible fear interview in mind. As the intakes were being conducted, attorneys walked over next to my work station to add names to a growing list of migrants tacked to the wall. When I inquired what the list represented, I was told the names affixed were those of migrants whose cases were deemed not strong. 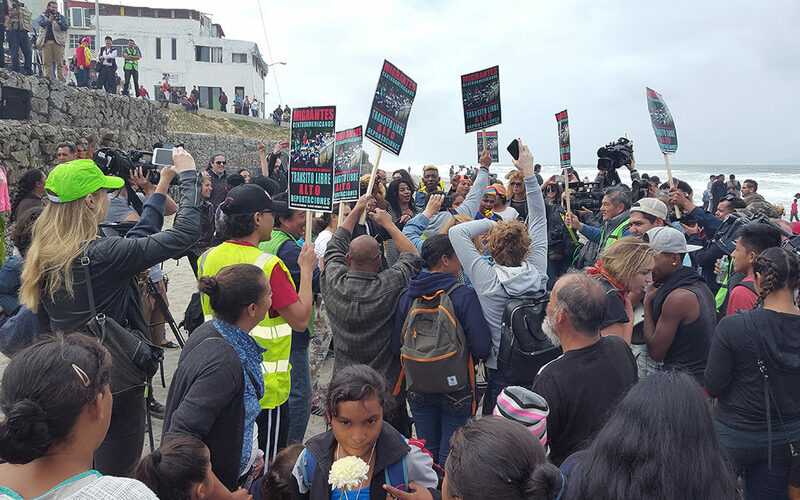 On the day initial members of the caravan planned to present themselves at U.S. customs, a rally was held in Tijuana in the morning at a beach where the rusty steel border barrier ends at the Pacific Ocean. As migrants and supporters gathered on the Mexican side of the fence, a small but vocal number of supporters and protestors mingled on the U.S. side. 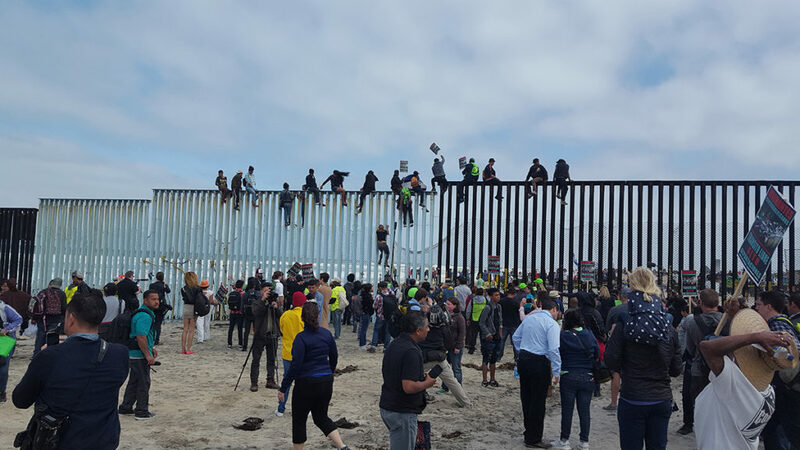 While being monitored by U.S. Border Patrol agents, some migrants climbed the fence and sat on top. In contrast to earlier encounters I had with exhausted, worried looking migrants, many of the individuals and families gathered on the beach were visibly relaxed. News reports that two couples married on the beach earlier in the day added to the festive mood. As music from loud speakers pulsed, groups of people spontaneously broke into dancing. Suddenly a cheer arose as a large kite was hoisted stories high; a brisk wind buffeted the sign bearing the message: REFUGEES WELCOME HERE. For some, despite their very justified worry and anticipation of what might unfold at the border crossing later in the day, the gathering gave them a much needed and welcome respite from the difficulties and uncertainties they faced throughout their journey north. Knowing I am a veteran, someone pointed out to me that a veterans’ organization sign was being affixed to the barrier. I walked over to a middle- aged man putting up the sign, introduced myself, surprised to meet a representative of the Deported Veterans of America. The weathered vet related he had been arrested and jailed in the U.S. for a drug conviction. He explained that he, as well as other veterans he knew, could not handle the medications prescribed by Veterans Administration physicians for post-traumatic stress syndrome, which led to self-medicating with drugs. He spends his days helping vets readjust to life as deportees, ensuring they learn what veteran’s benefits they are entitled to. When I commented on the dramatic affect the kite was having on the migrants, he pointed out a fellow vet on the beach who made the kite. Later in the day, after an hours-long final briefing on what might be expected at the San Ysidro port of entry, an initial group of migrants was escorted in a procession to the border. Upon arrival, they were told the facility was at capacity which led to a decision to set up makeshift shelters on concrete outside a maze leading to the customs entrance. Customs and Border Protection staff issued a statement explaining that the facility’s daily case load varied depending on the complexity of cases, the migrants’ medical needs, and the amount of initial detention space available. Although slow walked at first, by May 4, approximately 70 migrants out of a total of 228 caravan members had entered the U.S. The ultimate disposition of the small percentage of migrants who succeed in getting their cases reviewed in an immigration court will takes months, and possibly years to resolve. Pueblo Sin Fronteras representatives indicated volunteers would coordinate with Tijuana-based shelters and attorneys to help migrants who planned to stay in Mexico. Staying in Tijuana presents daunting challenges. According to an article in the June 3, 2018 issue of The California Sunday Magazine, Tijuana, despite its storied reputation as a city of exile, is reaching its limits: “ Without a single major aid organization providing relief, the flood tide of outsiders is pushing Tijuana toward a humanitarian crisis.” Although low paying jobs are currently available — due to the large number of manufacturing and assembly facilities — that could change abruptly given the rapidly growing number of deportees arriving from the United States, combined with a steady infusion of migrants from around the world. First-hand experiences related by migrants themselves, legal workers, social workers and others report the way migrants are treated throughout the vast U.S. immigration system varies. There is ample evidence of empathetic people “in the ranks,” in ports of entry, detention centers, immigration courts, and other immigration venues, demonstrating day in and day out continued evidence of an America that thought through its values when it developed a new immigration system after World War Two. Increasingly those carefully chosen values that guided, however imperfectly, the welcome of migrants from around the world are now imploding. Countless representatives of civil society have lamented the corrosive effect new immigration policies are having on our values as a people. in these fractious times, whatever foundational values are eventually forged for immigration will have incalculable consequences for migrants around the world. And for the United States.